If you’ve ever manually lifted a garage door you’ll know that they’re much heavier than they might appear! The reason your door’s system is able to pull it up so easily is thanks to the springs, which act as the muscle needed to get it open. This is why it tends to be noticeable when there’s an issue with the springs, with indications such as the door struggling to move and jerking a lot in the process, and it falling down to close rather than lowering slowly. If you’ve noted these signs, it’s time to have your springs looked at! It’s best to do it now, rather than wait for them to break completely later and leave your door unable to move. How Do Different Kinds of Springs Differ? The main difference between extension and torsion springs is in how they work, as well as their longevity. Extension springs are stretched out like a rubber band and doing so builds up tension that translates into energy. However, being pulled like this daily, strains the springs, and they wear down much more quickly. They’re also liable to cause damage when they break, thanks to snapping and ricocheting when they do. Torsion springs, however, simply twist up to store energy and last longer because of it, as are also less likely to cause harm if they break. Our team of trained technicians can take care of all of your spring’s needs in no time, no matter what kind they are! They may just need some adjusting after shifting over the years, or perhaps are too worn and need to be replaced entirely. In either case, we’ll do so safely, which is why letting professionals take care of it is highly advised. DIY is far too dangerous when it comes to springs, so it’s best to allow us to make sure it’s done properly and carefully! Call Garage Door Repair Cornelius to get your door working smoothly again! How do I know what size garage door spring I need? You can easily determine the size of the spring you need by measuring 10 or 20 coils starting from the end of the spring. Once you have the measurement of the coils you'll know the thickness you need. The next measurement is the length of the springs. Measure the entire length up to the nearest quarter-inch. If you’re not a 100% positive you’ve done this correctly, seek expert consultation to ensure you don’t get springs that aren’t perfectly suited to your door’s weight and size. 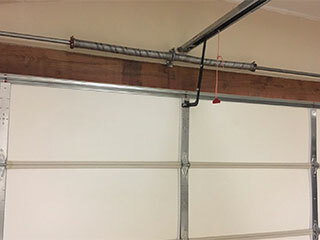 Can a garage door without springs still work? Garage door specialists do not recommend operating your door without the springs. The door itself is incredibly heavy and the springs take almost all of the weight. The cables help, naturally, but these are the parts that do most of the work. You should only open a garage door without springs if a professional repair service can't come on the same day and you need to get your car out because of an emergency. If you must do this, don't try to do it alone. Get help from multiple people and lift the door carefully. Can you tell me how to open a garage door with a broken spring? It is highly advisable to leave your garage door alone if you're faced with a broken spring. The springs bear the brunt of the weight of the panels, which are the last things you need to come crashing down on you. If you must open your door before a repair specialist arrives, you will need some friends to help you and you may need to prop up the door on both sides by using six foot tall ladders. Do so only if getting your car out of the garage is an urgent matter.